Early in his 30 year career as an Ingham County Probate Judge, George Economy found a place in his courtroom, and his heart, for something very special. He calls it “the happiest day of the year for me”. It’s called Christmas Adoption Day, a day set aside by Judge Economy to fully and legally unite children with their adoptive parents. Twenty-nine years and more than 6,000 adoptions later, Economy continues the holiday season tradition which has gained nationwide acclaim, including a feature on the CBS Evening News. A Detroit native, Economy moved to the Lansing area in 1970. His community service roots run deep, having been: President of the Highfields, Inc. Board, President of the Lansing Boys and Girls Club, President of the University of Michigan Alumni Association, Board member of the Capital Region Community Foundation, President of Holy Trinity Greek Orthodox Church and a member of the national University of Michigan Alumni Association Board. 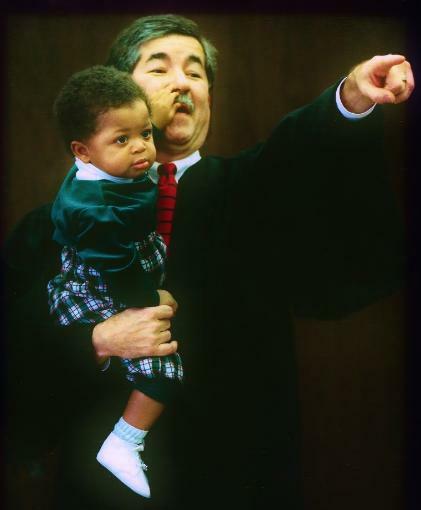 Christmas Adoption Day remains a major focal point of his judicial career. “A probate judge must deal almost daily with unpleasant circumstances among families. Adoption Day is completely the opposite. It brings families together the way few things can. We actually have people who purposely delay adoptions for a few months, just so they can be part of Christmas Adoption Day”. For Economy, the greatest gift is the sight and sound of families in love.